Do you have an upcoming project needing English transcription or even foreign language transcription? Not quite sure how to choose between the different types of transcription? Maybe you were just made aware that there are multiple types of transcription through the title of this blog post. That’s ok, we’re about to clear up the confusion. The right types of transcription to use, depend largely on the purpose that you have for your content once it has been transcribed. To help you make the right decision, lets take a look at the differences and common uses for each. Verbatim transcription is the written format of the spoken language. It captures all of the spoken words, including fillers like “ah”, “uh” and “om”, throat clearing and incomplete sentences. It also includes pauses, laughter and other sounds, which are all expected parts of spoken language. Verbatim transcription is usually one of the most expensive types of transcription as it takes more time to perform. However, it is seen as a valuable tool for market research studies, job interviews, police investigations and court cases. In all these situations, the behavior and reactions of the person being questioned is equally important as the spoken words. Intelligent verbatim transcription omits all “ums”, “oms”, laughter and pauses throughout the conversation. The transcriber performs some light editing to correct sentences and grammar and irrelevant words or sentences are eliminated. This type of transcription is often used in medical fields or within business communications. Our co-founder and COO wrote a more extensive article on intelligent verbatim transcription that might be worth checking out if this is one of the types of transcription that you’re particularly interested in. Edited transcription may be useful to those who plan to publish the transcribed content or have it translated to foreign languages. It is often required by lecturers or conference organizers who need the content written in a formal way. In this type of transcription a full and accurate script is formalized and edited for readability and clarity. What Types of Transcription Do I Need? Market Research: Market researchers are as interested in the pauses, laughs, “umms” and “ahhs” as they are in what the respondent has to say. Many filler words and gaps between sentences provide signals about how a respondent is feeling, even if their words suggest the opposite. In this case, verbatim transcription will be needed to convey the complete response of the person speaking. Medical Transcription: During medical transcription, it is imperative that the correct meaning from a doctor’s dictation is transcribed accurately into text. Sentences should make sense and filler words should be removed to increase ease of reading, however, the message must not be changed. An incorrect transcription of a treatment plan would have very serious ramifications. Medical research is also often done in foreign languages and then transcribed into English. 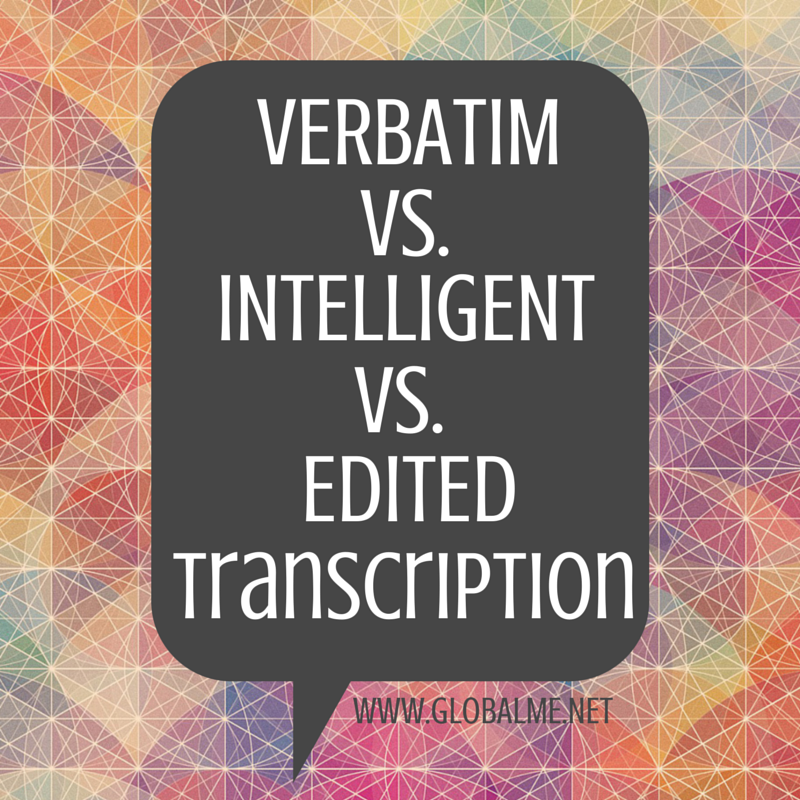 In both these cases, Intelligent Verbatim Transcription is predominantly the preferred type of transcription. Business Communication: Business owners and corporate executives require clear, straight to the point information. They don’t care to read through partial sentences and filler words in order to find out what the speaker is trying to say. Therefore, intelligent verbatim transcription would be the ideal solution because it offers a concise, and easy to read transcription. Published/Academic Document: Published or academic documents require an element of formality, thus making edited transcription the ideal solution. Incomplete sentences will be completed and informal speech will be converted to a formal written voice. As previously mentioned, many clients (e.g. market researchers) are as interested in the filler words and gaps between sentences as they are in the sentences themselves. Foreign language transcription brings an extra layer of complexity as the transcriber will need to understand the cues and meanings behind both the source and target languages for every laugh, pause and filler word. Arabic, Spanish, Mandarin, Bengali, French, Czech, Urdu, Punjabi, Turkish, Serbian and even the American Sign Language (to name a few) all have variations of different filler words and contain different meanings behind them. So how are these place holders translated? Transcribers will take their in-depth knowledge of both languages to insert the most appropriate filler words or to transcribe the same meaning behind gaps and laughs between sentences. This is where quality translation & transcription is critically important. Deciding which types of transcription to use depends wholly on the intended use for the content. Hopefully the explanations above will help shed some light on which types of transcription will be best for your next project. eLearning Software Comparison: Articulate Studio, Lectora Inspire, Captivate & StorylineAttending Localization World? Need A Boardroom Or Work Desk?